As previously reported, the Nationals kicked off their home opener of 2012 against the Cincinnati Reds. The sun was shining, the Shark was batting seventh, and the winds of fate were blowing throughout the ballpark. In some ways, the game was a mess. Brad Lidge blew a two run lead in the 9th inning to force extra innings. Ryan Zimmerman arguably made 3 errors in the game (although he was only charged for 1), and news broke that Mako Morse would be out for an additional 6 weeks. In other, more importants ways, the game was a thing of beauty. Gio Gonzalez pitched 7 shutout innings, the Shark hit the ball hard 3 times (although he had nothing to show for it...), and the Nationals won the game 3-2. Bernadina was at the plate in the bottom of the tenth with 2 outs and runners on 2nd and 3rd, when all of a sudden, Reds pitcher Alfredo Simon threw a wild pitch, allowing Zimmerman to score the winning run from third. When asked about the wild pitch after the game, Simon responded, "Are you kidding me? 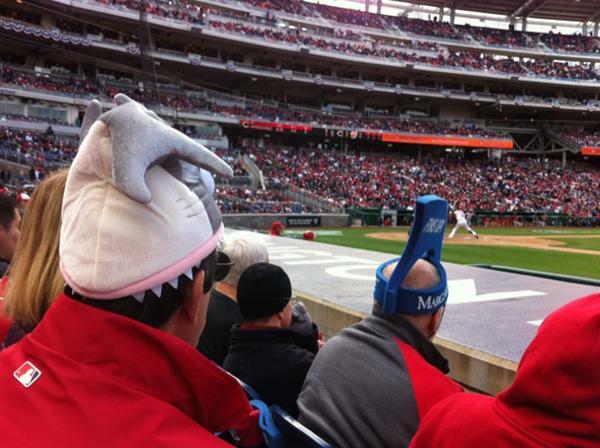 THERE WAS A F***ING SHARK AT HOME PLATE! I was scared sh**less." Reds manager Dusty Baker came to the aid of his relief pitcher explaining that the Shark's glare can invoke confusion and often times a very upset stomach. I think that the end of the game proves one thing, as pointed out by Jumpin' Zac Flash, the Shark is so good that he really doesn't have to do...anything but be there. With a few more fans rooting for the Shark, those hard hit outs will be dropping for doubles. Tyler and I will be back at Nats Park tomorrow night for the second game in the series. We will have a brand new sign for the 2012 season (which we will likely make just before the game), and we'll be sitting in the right field corner. Come say hi! My friends & I- 7 total, chomped for Sharkadina! !